Tornadoes can move very quickly and can leave large areas destroyed in their wake. Other tornadoes can be quite small, just touching down briefly. But no matter the size, tornadoes can uproot trees, demolish homes, destroy personal property, sheds, and swimming pools, and overturn cars. The power of a tornado is both terrifying and amazing. A debris cloud, even if there is no actual funnel visible. 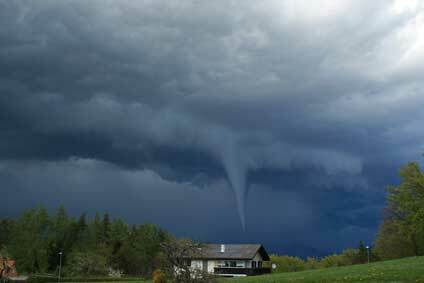 Damage caused by tornadoes is considered “wind damage” and is covered under most Canadian home insurance policies. But coverage does vary from policy to policy. And some companies offer different degrees of coverage depending on the package you’ve chosen. If you have a named-perils policy form, you need to look at the list of covered perils in your wording booklet to see if wind damage is covered. If you have a comprehensive policy form, you’re covered for all risks subject to a number of exclusions. All you have to do is look at the list of exclusions to see if wind is excluded. Chances are it’s covered. However, wind damage to things outside your home, such as trees, bushes, antennas, and satellite dishes are usually excluded. Any windstorm can be extremely damaging – lifting shingles, blowing out windows, blowing deck furniture around, breaking tree branches off, and even uprooting trees. And what if the wind causes damage to your home? That beautiful tree in your back yard could wind up crashing through your roof. Keep your roof in good repair. Old worn shingles are more likely to come loose during a windstorm. If your roof is nearing its life expectancy or is in poor repair, your insurance settlement could be limited. Often insurance providers will limit coverage to the depreciated value of the roof, rather than the replacement cost. Keep your trees trimmed, removing any dead branches. Consider consulting an arborist if your tree has any damage from past storms. Secure patio furniture or put it away for the winter. This is especially important for apartment dwellers. Imagine your patio umbrella blowing off your balcony. It could then damage someone else’s property, hit a vehicle, or injure a person. You could be sued for damages, so make sure you have liability insurance to cover you. During a Canadian winter, there is more to worry about than just wind damage. Snow, rain, and ice storms can also cause significant damage to your property. It’s frightening when you hear that a blizzard is coming your way. And we’ve seen the damage they can cause. Will your home insurance cover you if your home suffers damage during this type of storm? If the power goes out, and you have no heat in your home, causing your water pipes to freeze and burst, the resulting damage may be covered by your home insurance. There are always exclusions surrounding water damage, so it’s necessary to read the fine print. The main exclusion here is if you’ve been away for a specific length of time during the winter, often as little as four days, you need to make sure the heat is being maintained in your home. Some companies require your home to be checked daily by someone to ensure heat is being maintained. Others have less rigid restrictions. There is usually an option to turn off the water and drain the pipes if you don’t want to worry about the heat going out. Other water damage, such as coastal flooding is not usually covered by insurers in Canada. Recently, some types of flood coverage have become more available. Check with your insurance company to see if they provide flood coverage. Any heavy rainstorm could be too much for municipal storm sewers to handle. Consider installing a backwater valve if you live in an area prone to water backups. Also, if you have large trees in your neighbourhood, roots can grow into sewer lines, causing a blockage during a heavy rainstorm. Water backup is usually included in, or can be added to, your policy. If a huge snowstorm causes snow and ice to pile up on your roof, it can mean an awful lot of extra weight. In Canada, most home insurance providers give you the option of adding ice and snow damage insurance to your policy, while some include it automatically. Remember, as mentioned above, if your roof is nearing its life expectancy, or is in poor repair, your settlement could be limited. The resultant damage to the inside of your home will also be covered by most home insurance policies. If your home is damaged by an insured peril, like windstorm, burst pipes, or the weight of ice and snow, and you need to move into a hotel while repairs are being done, you’ll likely receive some assistance from your insurer. Additional living expense insurance covers your increase in living expenses, such as the cost of the hotel room, and the increase in food expense due to eating in restaurants. This is sometimes included in policies, and other times can be added as an optional coverage. Any damage to your home will be subject to a deductible. Deductibles can range from $250 to $5,000. This is another good reason to make sure your roof is well maintained, and kept clear of snow. When a storm threatens to come your way, you’ll need to batten down the hatches as well as you can, but some things are beyond your control. Check with your insurance provider to make sure you have the best coverage available. If the worst happens, and a tornado or other windstorm hits your area, the right home insurance policy will give you the coverage you need to get your home back.